lay a carpet to cover most of her bedroom floor. While cleaning her bedroom I found a checkbook from the 1970's which she wanted to keep. Tonight I sat on the porch swing at the farmhouse shucking sweetcorn for dinner while two deer lazily ate grass near the garden. They were so beautiful. They ducked into the woods when the Cox's arrived. Oh what a beautiful day. On my way to church this morning, I was noting the splendor of this place we live. The sky was blue and the sun was shining. God is so glorious! Grandma didn't sleep very well. She was a little winded this morning and had forgotten some of her things for her breathing treatments. She and I sat on the couch in the dining room drinking coffee and chatting as the morning sun lit the room. Last night I mentioned to her that I'd like to take her to Niagra Falls and for a horse buggy ride there. She proceded to tell me of a time when she was a teenager and had gone for a buggy ride on a Sunday. She said that it rained horribly and that the horse ran furiously coming to a halt inside a stable. She shared her lesson of not forgetting to keep the Sabbath Day holy. 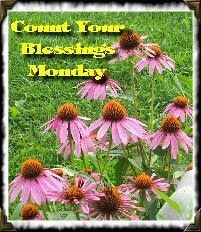 This week I'm counting the abundant blessings of the harvest. My good friends Rene'e and Lee gave me a pile of vegetables... fresh dug potatoes, some sweet onions, green peppers, hot peppers, and about 2 bushel of beautiful tomatoes this past weekend. My Mom (bless her heart) helped me to can about a bushel of stewed tomatoes and about a bushel of tomato juice. The cupboards are stocked with tomatoes ready for making stew, chili, and soups. Sunday evening there was a harvest party at the farm. A bunch of us met after dinner to share what we made from the harvest. There was eggplant parmasan (my favorite), sausage with fresh onions and peppers, fresh salsa with chips, two kinds of soup, pear pie, and more. We sat, relaxed, and enjoyed the harvest goods. Come share your blessings with others. Go to Marci's blog at Down On The Farm and link up. Achmed... this is SO wrong! Sunday - church, lunch with hubby, Dinner is in the crock-pot, thinking about a little nap. My beloved Penny has been back with me since June 28th. On August 5th I FINALLY started riding her again. It's been on and off since then. I'm learning the trails and gaining confidence with each new ride. It's funny that when I get on her I'm mentally riding her from years ago... when she was a real pistol. She keeps amazing me. She is so grown-up now. She's such a willing little trooper. I'm delighted to report that tonight we went on our first SOLO ride. I thought I wouldn't make it down the driveway or even around the field without a fight, but with a little pressure and some encouraging words she put one foot infront of the other and off we went. We zig-zagged all over the forrest behind the barn. There are very nice trails that are trimmed and wide enough to ride two-wide. We went up the hill and down and around and over the river and thru the woods... you get the idea. She worked up quite a sweat and we leisurely walked back home. I'm so pleased!!!! This solo ride was a milestone... like I'm chipping away at my goals one ride at a time. It's fantastic!!! Now if I'd just learn to TAKE the camera with me! I even strapped on the saddle bag that K got me for my birthday, but didn't have anything in it. Ugh. The barn-time came to a close after giving her a cool sponge bath and spoiling her with a couple of apples. What a way to close out my day! I am thankful for the change of season which is approaching quicker than we might think. The cooler, fall-like weather has put a spring in my step. As I commute each morning my eyes search the horizon for the first glimpse of the Lord's splash of color that I'm so anxious to witness. The days are warm and comfortable and the mornings and evenings are crisp. Oh how I love the change of seasons! Sting My Heart is the host of Thankful Thursday. Join us in sharing what we are thankful for. It's time for "Back to School" for many children. I was thinking last night about how direction-less I was in my school days. I always knew that school was necessary, but I wasn't sure why. I went because I had to. It's not that I didn't enjoy learning, but looking back I really don't think I had the ability to maintain focus throughout my classes. I really didn't do very poorly overall, just average. Except 4th grade Social Studies... I didn't want to learn about the indians! I had a recurring nightmare about indians and this was not something I had any desire to learn about. Thus... I got a big fat F for that six-week period. OOPS! I think if I had comprehended the true purpose of education I might have been something different... or done better at it at the time. I went to Business school and studied "Medical Management." I thought maybe I'd be an office manager or something of that nature. I already had some experience in the office and billing so why not. Actually these studies came very easy for me due to my experience and I am pleased to report that I graduated only 2nd in my class. I almost tied for first, but my friend Jennifer beat me by .1 in th end. WOW! So schooling was a success and I was off to find a new job. I had a few jobs before I found the one I'm in now. When I found the job, I had not even realized there were such persons out there... credentialing practitioners and/or Medical Staff Secretarial work was not in my radar, but the woman who hired me said that my experience working with docs and my plans and projects for office improvement at my then current job were signs that I was perfect for such a position. It paid $50 more each week taboot! Sign me up!!!! I've been at this job for 6+ years now and my position has evolved several times. I LOVE change and this is a constant in my current position. God has a plan for all of us, but he gives us the free will to choose our own path. I'm not suggesting that by not having direction back in school days that I have deferred from the Lord's path for me... I am simply voicing my regret for having lack of insight into my future earlier on. I am pleased with where life has brought me and recognize the abundant blessings that have been showered on me for the paths I did choose. This morning I am counting the many blessings of the summer that is quickly coming to a close, much of which is recapped below. I'm grateful for my pony and the sweet sweet lady that is keeping her for me. I'm grateful for long summer rides that take me back to times gone by. I'm thankful that my husband is so very loving to know that I needed her and to set aside funds to make that dream a reality. I'm thankful for the vegetable harvest and family that supports one another by sharing. I'm thankful for my sweet grandmother of years ago who showed me how to can stewed tomatoes and the mother who keeps that experience a reality. I was blessed by the little ones who visited us this summer, the pitter-patter of their little feet, the enlightened expressions upon greeting our pets, and the laughs, cries, and whines that we experience only a few times each year. There are so many blessings to count. Come join us in sharing them so others may be blessed by what the Lord has bestowed upon you. Go to Down On The Farm and link up. Thanks Marci!!! The blue ones name is Gonzo and the yellow is Sunshine. Wow. I have barely posted all summer long. You know when someone has a new child they kind of find themselves too busy for all the activities of their former life???? Well... having my pony is like having a child. For me anyway. I am spending a lot of time spoiling her. I guess I'm making up for lost time or something. It's like I'm falling in love with her all over again and with each new ride it just keeps getting better and better! I had a fantastic birthday. I'm a whopping 35 now. Despite usual morning aches and pains I still don't really feel old. Although... one night K wanted to go out for a drink and I told him it needed to be some place quiet because I'm 35 now and I prefer the prim and proper scene as opposed to the loud and obnoxious ones. HA!!! K got me this fantastic PINK riding helmet which is getting much use these days. 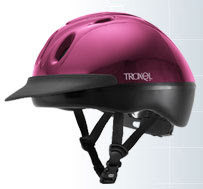 I never used to wear a helmet for trail riding, but now that I'm older I'm a little more safety conscious. It's a good thing. He also got me a small PNK bag that hangs on the horn of my western saddle so I can potentially take my camera riding with me or a bottle of water or whatever. Renee & Janet got me a new black saddle pad, a purple and black halter for her, a purple lead rope, and a lick-it treat for her. I need to get her a lickit holder. I was pleased to be so spoiled with equine related birthday goodies! Aside from my birthday, I've been busy with WORK, helping some friends put in hay, and other little things. We had a visit from my sister and her family while the kids participated in Mom's "Grandma Camp" for a week. I took some time off to enjoy their visit and had another special date with Esther to ride the horses and play with the doggies. 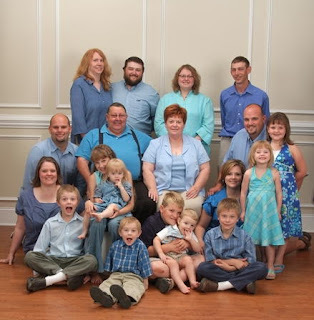 While they were in town we had a whole-family portrait taken. This includes my parents, siblings with inlaws and their children. K had the opportunity to assist me putting in hay this past Friday. For his trouble he was offered the opportunity to ride with us. We were out for two and a half hours and it was fantastic. My dream is to one day have a place where we can have at least 2 horses so we can ride together more often. He does like to go, but rarely has the opportunity since we only have one horse. Many thanks to Janet for allowing him to use one of hers. Yesterday I helped Mom can some stewed tomatoes. The kitchen here is just so small. I canned last year, but it was not efficient. Uncle Charlie supplied the goods and we split the end result 3-ways. That was great because it was just about the amount we'll use between now and next summer. Someday I'd like to have a garden to produce my own vegetables for canning and I'd like to have a large kitchen and pantry for preserving such things. That's something I remember from childhood... always canning and freezing in the summer and enjoying the goods all year round. FRESH frozen corn for Thanksgiving.... Nothing like it! That's about it I suppose. Back to the grind now. I hope to get better at regular posting in the weeks to come. Actually, I have a long list of aspirations for the fall season which I'd like to accomplish. I just had to post this because Carrie posted a similar picture from her families recent trip to the zoo. Ha ha ha... too cute! I see they are way more sophisticated these days... they give you a bucket! I always say... 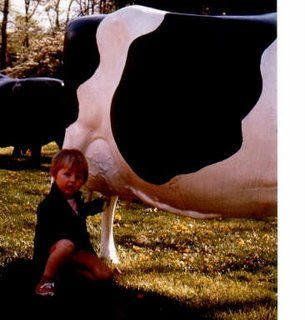 I was born to milk cows!